This Little Piggy Catering is the top casual wedding catering company in Minnesota. 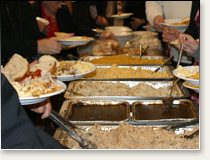 We’ve catered thousands of wedding receptions in barns, backyards, parks, community centers, etc. Please give one of our experienced wedding planners a call at 612-332-7571 to start customizing your day.